Go to http://bit.ly/1SWoOD7 to follow along. Links are in blue boxes, green is just emphasis. Use ↔ to navigate. first ever maps: star maps If we completely reduce world/cartographic history and bastardize a timeline, we can reduce the history of cartography to three periods (note: this is really really wrong) and we can say that the first series of maps ever produced in human history were of the stars! Star maps helped humans understand how time passes, how seasons are changing, which direction is north, which way is home, etc. At their most basic functions, maps are information. later map developments: parcel maps Jumping ahead a couple of millenia, we see new kinds/new uses of maps emerging as a result of surveying. In Seeing Like A State, political scientist James Scott describes the real and tragic process of European colonization of Africa, specifically Tanzania. He describes that when colonists arrived, their first imperative was to apply a European notion of order to a landscape that to them was chaotic and unplanned. Specifically, tribal customs of sharing land for farming and communally using fields for grazing were untenable, and so they began to streamline, to standardize, to MAP, to make the landscape more manageable under their imposed rule. "[T]hey were maps that, when allied with state power, would enable much of the reality they depicted to be remade. Thus a state cadastral map created to designate taxable property-holders does not merely describe a system of land tenure; it creates such a system through its ability to give its categories the force of law." - James Scott And we see that in many many instances of colonization, the first steps were to - standardize first and last names, take a census, to manage people; - standardize systems of weights and measure, & language, to manage resources; - & to make maps to simplify and clarify land ownership, to (a) extract taxes and (b) exert control So, in both a very important, and in this case a very nefarious sense, we can see that MAPS = POWER. Volunteering time to generate geospatial data for parts of the world where it is incomplete or inexistent. As we said, geospatial data is agency. It can be used for proactive measures, like city and community planning, resource mapping, environmental studies, lobbying for representation, etc. 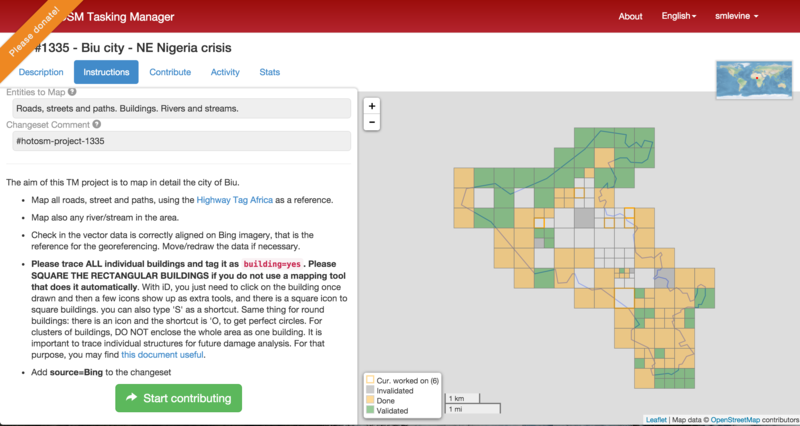 But it can also be used for reactive measure in the wake of humantiarian crises, when geospatial data is key to first responders on the ground, who at a very basic level, first need to know where there are residential communities and settlements that need aid, or to be evacuated. Then they need data for routing, navigation, knowing which roads are passable, etc. By being a humantiarian mapper, you're making this all possible. 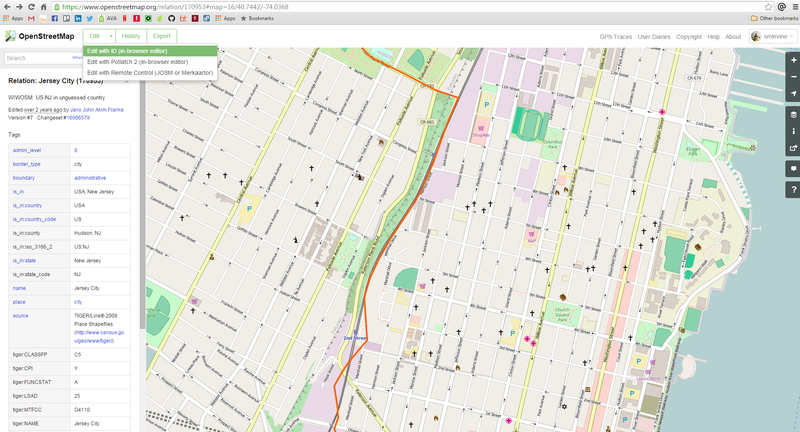 What is OpenStreetMap? Why OSM? OSM is like Wikipedia for maps. It's all open data! Try mapping somewhere that's not well mapped already. Remember to hit save, often. HINTS: Square corners with "S", and use forward and back buttons. 1. DO NOT COPY FROM GOOGLE . Don't even think about it. 2. Don't add things you're unsure about/things that aren't verifiable. 3. Leave good changeset comments. How can I help create data for somewhere I've never been? By tracing buildings and roads visible from satellite imagery. You don't need to know the name, just pointing it out on the map is helpful. We'll do this just like before, using the iD editor. Two new things: (1) Locking/unlocking a task (2) Read the instructions! Locking a task tells others that you're working on it, and avoids having several people editing the same area at once. If you're done with a task, or don't want to do anymore, or get stuck, save your changes and unlock the task so someone else can pick up where you left off. Instructions are key! Notice here that you're asked to leave a changeset comment noting where the satellite imagery came from. Pay attention to details about tags. Thanks to MaptimeHQ for presentation & map inspiration, always.